It's time for the tenth update & mini-challenge! Here's your challenge: Tell me, what is the funniest/most inspiring thing you have read so far in the read-a-thon? How I'm currently feeling: I'm feeling good! The book I'm reading is really WIERD though. It's kind of like enders game, but has too much experimenting on children for my taste. Over half-way done, though! I'm definitely going to reach my goal! The three books I've read so far haven't really been funny or insipring... one was about a cutter-girl, one was about an extremely distressed wolf-girl, and one is about experimenting on and kidnapping children. There was one pretty funny character in Wolfsbane. Lots of mooning and inappropriate jokes. I chuckled a couple times. 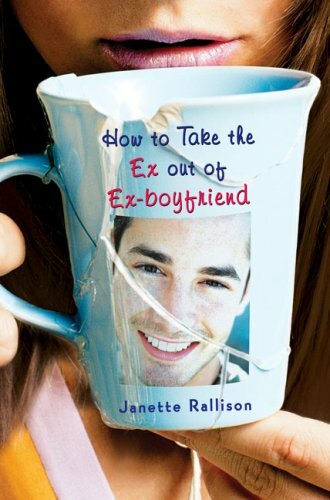 If YOU participate in this update and mini-challenge, you will be entered to win a copy of How to take the Ex out of Ex-Boyfriend by Janette Rallison! Link to your post below in the Mr. Linky. If you want to link to your post, but do not want to be entered to win How to take the Ex out of Ex-Boyfriend, merely place two asterisks before your Mr. Linky entry. This giveaway will only be open until Update #11 is posted at 6:00pm MST. a funny book i read was never cry werewolf, it was a great novel and i found myself laughing a lot. And Chime was a great novel, that was about coming to terms about her past and finding herself lovable again. Sorry I missed the reading marathon! Maybe next year! Funny, that I'm just getting the hang of the linking thing now! I had no problem updating my blog, but I kept forgetting to do the Mr. Linky thing, so I don't know if anything yesterday or this morning registered. Makes me wish I chose funny books to read! I read Angus,thongs and full frontal snogging last night and it was hilarious. How I'm currently feeling: really good! Feel like I'm in the groove; ready to read another book! Mini Challenge: Funniest thing I've read was "Real Live Boyfriends" by E. Lockhart. Definitely some laugh out loud moments! Most inspiring: Carnet de Voyage by Craig Thompson. It has given me a travel bug! That was an interesting question to think about. I would've entered the giveaway if I hadn't already won a copy of this a while ago, and I didn't want to be greedy!